The Fullerton College Umoja Community and the Ethnic Studies Department, welcome the entire college community to join us for this annual cultural tradition! 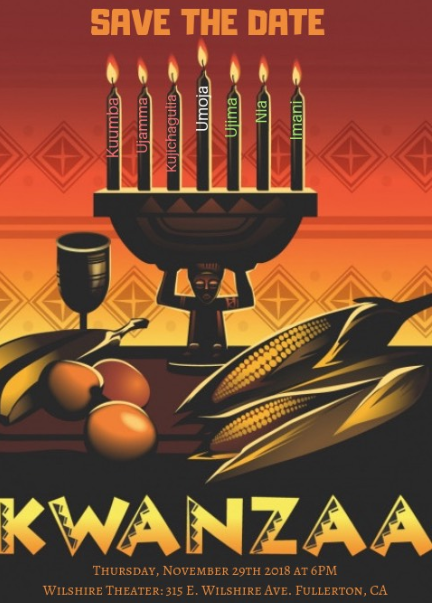 Kwanzaa is an African American and Pan-African holiday which celebrates family, community and culture. Celebrated from 26 December thru 1 January, its origins are in the first harvest celebrations of Africa from which it takes its name. The name is derived from the phrase “matunda ya kwanza” which means “first fruits” in Swahili, a Pan-African language which is the most widely spoken African language. The Kwanzaa Celebration is conducted by Fullerton College students who are members of the Umoja Community and/or enrolled in Ethnic Studies courses in African American history and studies.